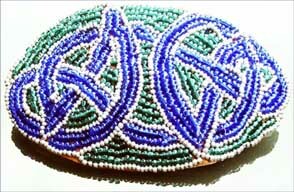 First, find a nice pattern for your hairslide. 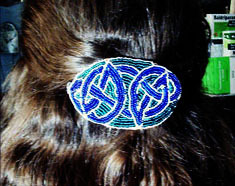 You can draw it yourself or find it via Google … for mine I typed in “celtic knot” and got lots of results. Make sure it is not too complicated – the more lines, the harder to sew, and if it gets too much it will probably not look good anymore. 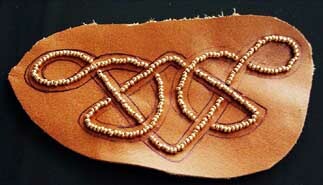 To get the pattern on the leather, either print it out or draw it on a piece of paper. Put that on the leather and follow the lines with a ballpoint pen, pressing hard on the paper. The lines should be visible on the leather now. Re-draw the lines on the leather with a ballpoint pen so that they’re easier to see. Now start the sewing. I recommend starting with the outline and all the thin lines, as seen on Picture 2. 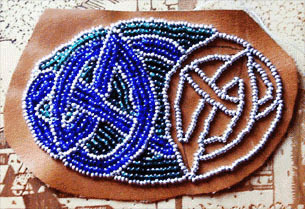 To sew the pearls on the leather, take 4 pearls on the needle and sew them on the leather along the line and then go through the last 2 pearls again (see Picture 3). Never take more than 4 pearls or it will get too loose. After sewing the lines, fill the rest with another colour. When you have finished sewing the pearls on, cut the leather very close to the outline you have sewn but be careful not to cut the nylon thread. Cut the second part of the leather in the same shape as one you’ve sewn the pearls on and glue both parts together, this will make the hairslide firmer. Finally, sew on the metal clip as seen on Picture 1. Make sure you don’t see the nylon thread on the side with the pearls. The last is very nice. It’s wondeful!